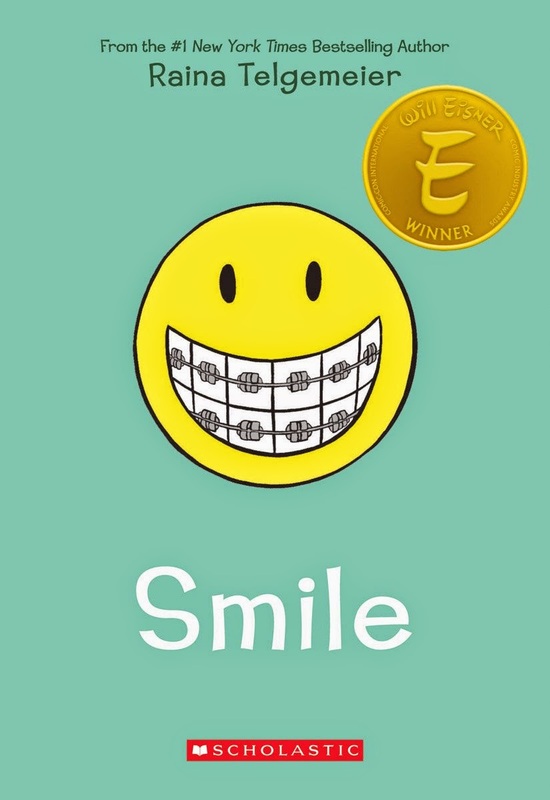 For November, my tween program was a book discussion of one of my favorite graphic novels Smile by Raina Telgemeier. Only three kids joined me for this program, sadly, but they really enjoyed the book and we had a fun discussion. They also liked the craft (which I think would be a fun passive program activity on its own) and YouTube videos. As the kids came in, I gave them a word search I made featuring characters from the book (PDF). This was to keep them busy for a few minutes and served as a sort-of ice breaker. I put together a playlist of neat YouTube videos featuring Telgemeier to show the kids and compiled discussion questions from The Mother Daughter Book Club (PDF) and Pierce County Library System (DOCX).The playlist also includes the video on how to play this month's Minute to Win It game: Baby Blockin'. The kids each got a plastic dinner plate and 5 wooden baby blocks and had 60 seconds to balance them on top of their head. Our craft was emoji portraits. I found emoji pumpkin decorating patterns on a lifestyle blog and then I created a quick circle background (PDF) using the basic shapes drawing tool in Publisher. I printed these on yellow paper to match the book's cover but any color would be fun. I made sure there was enough for everyone to do more than one portrait if they wanted. Thanks Anne! I used your emoji idea in my Double Digit Book Club (ages 10 and up) today, and it was a big hit. The absolutely HAVE to have an activity to keep their hands busy during the discussion or all heck breaks loose. This was perfect.